November 5, 2015 November 7, 2015 . A thorough study of the Zhouyi—the core of the I Ching (Yijing), the Chinese Book of Changes. Edward Shaughnessy, a professor at the University of Chicago, is one of the world’s leading specialists in early Chinese texts. He surveys the field and then hones in on several texts that have surfaced in recent decades: fragments of the legendary Guishan and bamboo-slat versions of the Zhouyi. These finds were significant as they provided the earliest extant Yi documents, the oldest of these being the so-called “Shanghai Museum” manuscript, from the fourth century BCE. 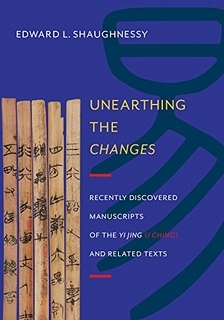 Shaughnessy provides for each text a facing-page comparitive translation of the “received text” and notes varients from sources such as the Mawangdui I Ching (which he translated and published in 1997). He gives discussion of the received order, use of early numerals, growth of the Yi tradition, and issues of archeology and conservation. Unearthing the Changes will appeal to the archeologist in everybody. While this is a highly detailed and technical book that will serve specialists well, it is clearly enough written for non-specialists to enjoy. It is beautifully designed (though with a somewhat small font), and includes photographic examples of the excavated bamboo-slat texts. Shaughnessy’s attention to detail is admirable, and makes this an essential book for those interested in the history of the I Ching.